DK Publishing (Dorling Kindersley), 9780756613747, 96pp. Numbers create the structure to our universe. Without numbers, computers would not work and cars would not go. There would be no way to quantify things. You wouldn't be able to ask "How many?" or "How much?" We would not understand time or distance. Sports records wouldn't matter Go Figure is a math book filled with the weird and wonderful side of math and numbers. Discover why there are 60 minutes in an hour, why daisies have to have 34, 55, or 89 petals, and why finding a prime number could make you a millionaire. 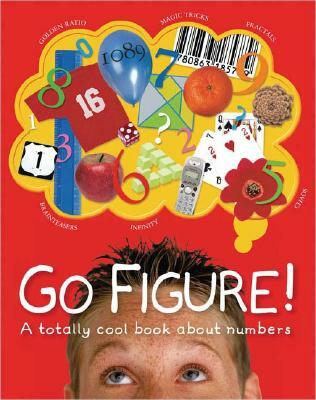 Go Figure is also packed with activities that children can try out on their own or with friends, including brainteasers, magic tricks, and things to make, while also learning about the simple puzzles that stumped the world's brainiest mathematicians for centuries. Go Figure is a fun and quirky look at the magical world of numbers, without the effort of a math textbook.